If you do have heart disease, Centennial Hills Hospital Medical Center has specially trained physicians and nursing staff to treat a broad range of emergency and non-emergency heart conditions. Our Chest Pain Center (see below) and 24-hour-a-day emergency department ensure that you get the cardiac care you need. Learn about some of our services below. The Chest Pain Center at Centennial Hills Hospital Medical Center in Las Vegas offers rapid, round-the-clock, evidence-based treatment of heart attack and suspected heart attack. The center is accredited by the the American College of Cardiology. To receive accreditation, a center must show that it combines evidence-based science, quality initiatives, clinical guidelines and best practices to produce an effective care model for heart attack and suspected heart attack. In addition to the standard accreditation, Centennial Hills Hospital has received an enhanced accreditation from SCPC, making it a "Chest Pain Center with Primary PCI." Hospitals awarded this designation have primary percutaneous coronary intervention (PCI) available 24 hours a day, 7 days a week. PCI is commonly known as angioplasty, a procedure used to treat the narrowed coronary arteries found heart in disease. To receive the enhanced accreditation, a hospital must have a call team of cardiac catheterization laboratory staff and an interventional cardiologist who arrive at the cardiac catheterization lab within a short, pre-determined window of time, day or night. Accredited facilities also must have documented processes designed to maximize treatment time and improve outcomes. 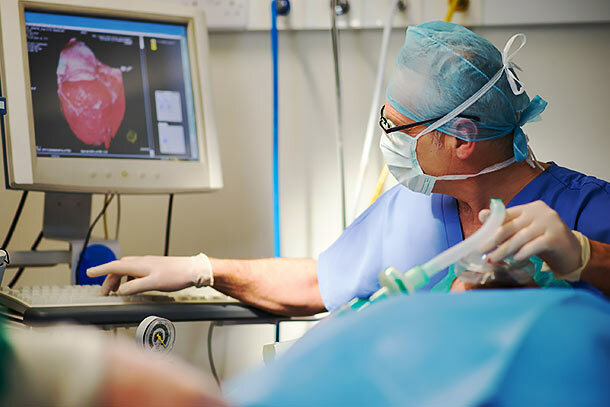 Cardiac catheterization involves the use of radiological equipment to both diagnose and treat some forms of heart disease. During radiologic imaging, interventional tools such as balloons and stents are fed through a catheter into the coronary arteries to reduce stenosis (blockages) and improve blood flow. In some cases, a contrast material (dye) is injected into the coronary arteries to diagnose blockages. In other cases, cardiac catheterization simply involves measuring the pressure within the chambers of the heart. Doctors in the cath lab may also perform implantation of permanent pacemakers and automatic implantable cardioverter defibrillators (AICDs) used to stablize cardiac rhythm disturbances. Also available is intravascular ultrasound, which is used to assess the severity of arterial blockages. Echocardiography services include transthoracic and transesophageal echocardiograms. Centennial Hills Hospital cardiac specialists screen for Peripheral Arterial Disease (PAD), which occurs when plaque builds up in the blood vessels and restricts blood flow. Left untreated, PAD can cause pain in the legs and feet, and can lead to aortic aneurysms, lower extremity ischemia (insufficient blood flow) or even death. PAD affects about one in 20 Americans over age 50, and the chances of having the condition increases with age. Cramps in the leg muscles (calf, thighs or buttocks) during activity, such as walking or climbing stairs. Sores or wounds on toes, feet or legs. One leg that feels noticeably colder than the other leg. Discolored skin on the foot or leg. To learn more about cardiac services at Centennial Hills Hospital Medical Center, call 702-835-9706. To obtain a referral to a cardiac specialist who practices at Centennial Hills Hospital Medical Center, contact our free physician referral service at 702-388-4888.